So spring is pretty much coming back around and my nails really needed a painting so I decided to go through my collection of nail varnishes and see what took my fancy. While looking I suddenly realised I had managed to collect rather a few pastels and thought they were looking lovely and are quite in right now and will definitely take off in the spring! First couple of colours are citrus colours! The orange colour is from Natural Collection and was £1.89 from Boots. This colour has a cute shimmery glitter in it and is called"Antique Coral". 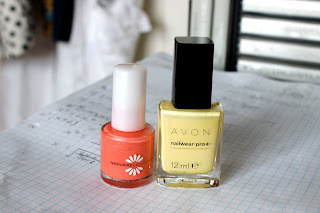 The yellow is from Avon and I got it for christmas so I don't know how much it was and is in the colour "Lemon Sugar". Yellow is a little hard to wear for me on it's own so I tend to wear it with other colours but it really is a lovely colour! Both of these nail varnishes last surprisingly well also! 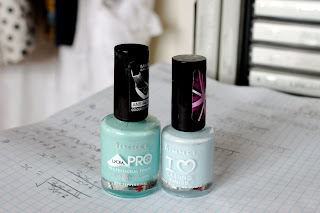 These next two are cool colours, both from Rimmel. The green is called "Peppermint" and was £4.59 and the blue is "Sweet As Sugar" and was £2.99, both from Boots. I LOVE the green colour I have actually found mint amazingly wearable and versatile and the consistency of the actual polish is great and it is very durable! The blue was quite disappointing as it needed about 5 coats to not seem too thin and it wasn't very durable either; only lasting about a day, but the colour is beautiful. These two colours are more girly. 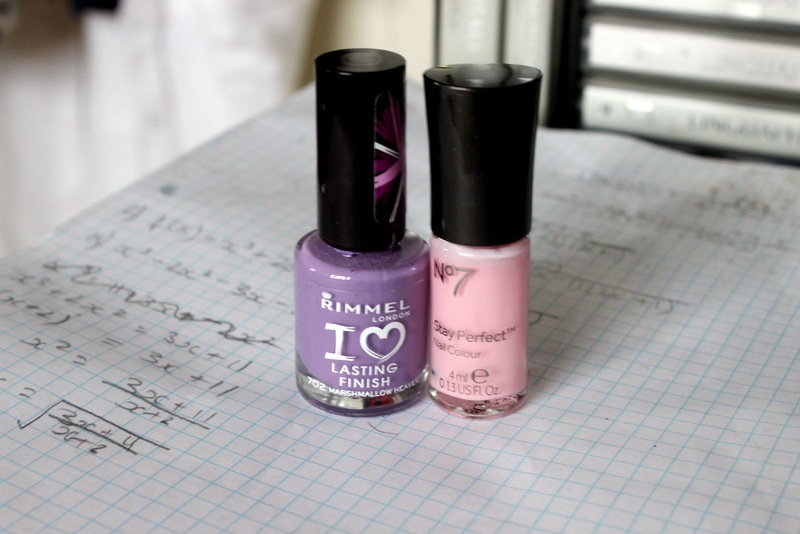 The lilac colour is called "Marshmallow Heaven" and is by Rimmel. I got it for £2.99 from Boots. It's a really great consistency of formula, only needs one coat and lasted 4 days, which is great! The pink is from No7 and is called "Pink Pure". I bought it in a set in the sale for £10. It was a very thin formula and needed many coats, which just wouldn't dry and so got smudged, and when I finally got it sorted it chipped within 5 hours, every time! Really disappointed as the colour is lovely!